In that day his strong cities will be as a forsaken bough and an uppermost branch, which they left because of the children of Israel; and there will be desolation. Because you have forgotten the God of your salvation, and have not been mindful of the Rock of your stronghold, therefore you will plant pleasant plants and set out foreign seedlings; but the harvest will be a heap of ruins in the day of grief and desperate sorrow. Is not the food cut off before our eyes, joy and gladness from the house of our God? The seed shrivels under the clods, storehouses are in shambles; barns are broken down, for the grain has withered. Thus says the LORD: "For three transgressions of Judah, and for four, I will not turn away its punishment, because they have despised the law of the LORD, and have not kept His commandments. Their lies lead them astray, lies which their fathers followed. But I will send a fire upon Judah, and it shall devour the palaces of Jerusalem." Thus says the LORD: "For three transgressions of Israel, and for four, I will not turn away its punishment...."
These passages show that Israel will greatly suffer in the "Great Middle East War" along with their neighbors. As discussed at the beginning of this study, the prophecies in the first few chapters of Amos found fulfillment in the Assyrian conquest. Parallel wording in other passages suggest the first few chapters of Amos have a dual fulfillment in the "Great Middle East War." Daniel 9:11-14 - Yes, all Israel has transgressed Your law, and has departed so as not to obey Your voice; therefore the curse and the oath written in the Law of Moses the servant of God have been poured out on us, because we have sinned against Him. And He has confirmed His words, which He spoke against us and against our judges who judged us, by bringing upon us a great disaster; for under the whole heaven such has never been done as what has been done to Jerusalem. "As it is written in the Law of Moses, all this disaster has come upon us; yet we have not made our prayer before the LORD our God, that we might turn from our iniquities and understand Your truth. Therefore the LORD has kept the disaster in mind, and brought it upon us; for the LORD our God is righteous in all the works which He does, though we have not obeyed His voice. Daniel 9:20-24 - Now while I was speaking, praying, and confessing my sin and the sin of my people Israel, and presenting my supplication before the LORD my God for the holy mountain of my God, yes, while I was speaking in prayer, the man Gabriel, whom I had seen in the vision at the beginning, being caused to fly swiftly, reached me about the time of the evening offering. And he informed me, and talked with me, and said, "O Daniel, I have now come forth to give you skill to understand. At the beginning of your supplications the command went out, and I have come to tell you, for you are greatly beloved; therefore consider the matter, and understand the vision: "Seventy weeks are determined For your people and for your holy city, To finish the transgression, To make an end of sins, To make reconciliation for iniquity, To bring in everlasting righteousness, To seal up vision and prophecy, And to anoint the Most Holy." God said He would punish Israel under the yoke of Gentile rule for "70 weeks," or 490 years because they transgressed the Law. 483 of those years had passed when Jesus died on the cross. The 490-year time-clock stopped when the Messiah was "cut off," as prophesied by Daniel. The last seven years left on the clock will start when Israel confirms a covenant brokered by the antichrist. I cover this prophecy in Daniel in more detail in the "Olivet Discourse." As history has shown, most peace covenants come in the aftermath of war or significant conflict. Because the scriptures are clear that God will mete out judgment on both Israel and their neighbors, it is possible that the "Great Middle East War" is the event that leads to the ushering in of that last period of punishment for transgressing of the Law. So while the war will punish Israel like at the time of the Assyrian conquest millennia ago, the "Great Middle East War" could be the event that directly leads to Daniel's 70th week and the final punishment for transgressing of the Law. In other words, the "Great Middle East War" is not part of "Daniel's 70th week," but may lead to the "confirming of the covenant" in Daniel 9:27, restarting the 490-year time-clock. Colossians 2:11-14 - In Him you were also circumcised with the circumcision made without hands, by putting off the body of the sins of the flesh, by the circumcision of Christ, buried with Him in baptism, in which you also were raised with Him through faith in the working of God, who raised Him from the dead. And you, being dead in your trespasses and the uncircumcision of your flesh, He has made alive together with Him, having forgiven you all trespasses, having wiped out the handwriting of requirements that was against us, which was contrary to us. And He has taken it out of the way, having nailed it to the cross. Zechariah 12:10 - "And I will pour on the house of David and on the inhabitants of Jerusalem the Spirit of grace and supplication; then they will look on Me whom they pierced. Yes, they will mourn for Him as one mourns for his only son, and grieve for Him as one grieves for a firstborn." Romans 11:25-27 - I do not want you to be ignorant of this mystery, brothers and sisters, so that you may not be conceited: Israel has experienced a hardening in part until the full number of the Gentiles has come in, and in this way all Israel will be saved. As it is written: "The deliverer will come from Zion; he will turn godlessness away from Jacob. And this is my covenant with them when I take away their sins." All of Israel being saved will fulfill the prophecy of the "dry bones," when they become spiritually alive by the Holy Spirit breathing into them in Ezekiel 37. As we will see in the next few sections, the "Great Middle East War" is likely the event that initiates the spiritual awakening of Israel. Gird yourselves and lament, you priests; wail, you who minister before the altar; come, lie all night in sackcloth, you who minister to my God; for the grain offering and the drink offering are withheld from the house of your God. Consecrate a fast, call a sacred assembly; gather the elders and all the inhabitants of the land into the house of the LORD your God, and cry out to the LORD. Gather yourselves together, yes, gather together, O undesirable nation. Ezekiel 37:15-17 - Again the word of the LORD came to me, saying, "As for you, son of man, take a stick for yourself and write on it: 'For Judah and for the children of Israel, his companions.' Then take another stick and write on it, 'For Joseph, the stick of Ephraim, and for all the house of Israel, his companions.' Then join them one to another for yourself into one stick, and they will become one in your hand." I mention this prophecy in Ezekiel 37 in this section, because of the context in the previous section about the "dry bones" coming to life, and the spiritual revival that begins to spark after the "Great Middle East War." The Joel and Zephaniah passages above show a gathering of the people of Israel together on a national scale, calling out to God in desperation. A spiritual revival will begin to take place after this devastating war. The covenant that Israel confirms at the beginning of the Tribulation is later broken by the defiling of a Jewish temple in the "abomination of desolation." Therefore, the covenant should include provisions to build the temple. This would make sense, because Israel begins a spiritual revival in the aftermath of the "Great Middle East War." This supports the notion that this war will lead to the confirming of the covenant and the beginning of "Daniel's 70th week." A study on dispensations shows that God will return to Israel during "Daniel's 70th week." God may use the "Great Middle East War" as an instrument to turn Israel back to Him, before He turns back to them at the beginning of the Tribulation. Ezekiel 36:8-11 - "But you, O mountains of Israel, you shall shoot forth your branches and yield your fruit to My people Israel, for they are about to come. For indeed I am for you, and I will turn to you, and you shall be tilled and sown. I will multiply men upon you, all the house of Israel, all of it; and the cities shall be inhabited and the ruins rebuilt. I will multiply upon you man and beast; and they shall increase and bear young; I will make you inhabited as in former times, and do better for you than at your beginnings. Then you shall know that I am the LORD." Ezekiel 36:12-15 - "Yes, I will cause men to walk on you, My people Israel; they shall take possession of you, and you shall be their inheritance; no more shall you bereave them of children." 'Thus says the Lord GOD: "Because they say to you, 'You devour men and bereave your nation of children,' therefore you shall devour men no more, nor bereave your nation anymore," says the Lord GOD. "Nor will I let you hear the taunts of the nations anymore, nor bear the reproach of the peoples anymore, nor shall you cause your nation to stumble anymore," says the Lord GOD.'" Ezekiel 36:16-21 - Moreover the word of the LORD came to me, saying: "Son of man, when the house of Israel dwelt in their own land, they defiled it by their own ways and deeds; to Me their way was like the uncleanness of a woman in her customary impurity. Therefore I poured out My fury on them for the blood they had shed on the land, and for their idols with which they had defiled it. So I scattered them among the nations, and they were dispersed throughout the countries; I judged them according to their ways and their deeds. When they came to the nations, wherever they went, they profaned My holy name - when they said of them, 'These are the people of the LORD, and yet they have gone out of His land.' But I had concern for My holy name, which the house of Israel had profaned among the nations wherever they went." Ezekiel 36:28-32 - "Then you shall dwell in the land that I gave to your fathers; you shall be My people, and I will be your God. I will deliver you from all your uncleannesses. I will call for the grain and multiply it, and bring no famine upon you. And I will multiply the fruit of your trees and the increase of your fields, so that you need never again bear the reproach of famine among the nations. Then you will remember your evil ways and your deeds that were not good; and you will loathe yourselves in your own sight, for your iniquities and your abominations. Not for your sake do I do this," says the Lord GOD, "let it be known to you. Be ashamed and confounded for your own ways, O house of Israel!" Ezekiel 36:33-38 - 'Thus says the Lord GOD: "On the day that I cleanse you from all your iniquities, I will also enable you to dwell in the cities, and the ruins shall be rebuilt. The desolate land shall be tilled instead of lying desolate in the sight of all who pass by. So they will say, 'This land that was desolate has become like the garden of Eden; and the wasted, desolate, and ruined cities are now fortified and inhabited.' Then the nations which are left all around you shall know that I, the LORD, have rebuilt the ruined places and planted what was desolate. I, the LORD, have spoken it, and I will do it." 'Thus says the Lord GOD: "I will also let the house of Israel inquire of Me to do this for them: I will increase their men like a flock. Like a flock offered as holy sacrifices, like the flock at Jerusalem on its feast days, so shall the ruined cities be filled with flocks of men. Then they shall know that I am the LORD."'" Today the desert is blooming after being desolate for centuries. These prophecies about the land have seen fulfillment during our generation. Since this all happened in the span of one generation, it is not out of the question that the prophecies surrounding this passage will also be fulfilled within that same generation. Alas for the day! For the day of the LORD is at hand; it shall come as destruction from the Almighty. "For the day of the LORD upon all the nations is near; as you have done, it shall be done to you; your reprisal shall return upon your own head. For as you drank on My holy mountain, so shall all the nations drink continually; yes, they shall drink, and swallow, and they shall be as though they had never been." "A Scepter shall rise out of Israel... and destroy all the sons of tumult." The "day of the Lord" against all nations, will be "at hand," and it will be "near" at the time of the "Great Middle East War." In other words, the time this war occurs will be close to the "day of the Lord," or near the beginning of the Tribulation, but that "day" will not have officially started yet. While we don't know what year the Tribulation will start or the "Great Middle East War" will occur, the wording about the harvest in the parallel passages mentioned a few sections back may suggest that the war will occur during the time that the crops are ready to harvest; late summer to fall. Jeremiah 30:18-20 - "Thus says the LORD: 'Behold, I will bring back the captivity of Jacob's tents, and have mercy on his dwelling places; the city shall be built upon its own mound, and the palace shall remain according to its own plan. Then out of them shall proceed thanksgiving and the voice of those who make merry; I will multiply them, and they shall not diminish; I will also glorify them, and they shall not be small. Their children also shall be as before, and their congregation shall be established before Me; and I will punish all who oppress them.'" Jeremiah 30:21-24 - "Their nobles shall be from among them, and their governor shall come from their midst; then I will cause him to draw near, and he shall approach Me; for who is this who pledged his heart to approach Me?' says the LORD. 'You shall be My people, and I will be your God.'" Behold, the whirlwind of the LORD goes forth with fury, a continuing whirlwind; it will fall violently on the head of the wicked. The fierce anger of the LORD will not return until He has done it, and until He has performed the intents of His heart. In the latter days you will consider it. As we continue on, take note of the highlighted wording here in Jeremiah and how it parallels the passages in the next section. O my God, make them like the whirling dust, like the chaff before the wind! As the fire burns the woods, and as the flame sets the mountains on fire, so pursue them with Your tempest, and frighten them with Your storm. "Amid shouting in the day of battle, and a tempest in the day of the whirlwind. Their king shall go into captivity, he and his princes together," Says the LORD. "Behold, he shall come up like a lion from the floodplain of the Jordan against the dwelling place of the strong; but I will suddenly make him run away from her. And who is a chosen man that I may appoint over her? For who is like Me? Who will arraign Me? And who is that shepherd who will withstand Me?" Woe to the multitude of many people who make a noise like the roar of the seas, and to the rushing of nations that make a rushing like the rushing of mighty waters! The nations will rush like the rushing of many waters; but God will rebuke them and they will flee far away, and be chased like the chaff of the mountains before the wind, like a rolling thing before the whirlwind. Then the LORD will be seen over them, and His arrow will go forth like lightning. The Lord GOD will blow the trumpet, and go with whirlwinds from the south. The LORD of hosts will defend them; they shall devour and subdue with slingstones. They shall drink and roar as if with wine; they shall be filled with blood like basins, like the corners of the altar. The LORD their God will save them in that day, as the flock of His people. For they shall be like the jewels of a crown, lifted like a banner over His land - For how great is its goodness and how great its beauty! Grain shall make the young men thrive, and new wine the young women. Before the decree is issued, or the day passes like chaff, before the LORD's fierce anger comes upon you, before the day of the LORD's anger comes upon you! Seek the LORD, all you meek of the earth, who have upheld His justice. Seek righteousness, seek humility. It may be that you will be hidden in the day of the LORD's anger. The passage in Jeremiah 30 from the previous section describes God's fury as a whirlwind. Nearly every parallel passage in this section shows that God is going to come against Israel's enemies "like chaff before the wind," or a "whirlwind," in anger and fury. Zechariah says that "God will save them [Israel] in that day." Jeremiah says that God will make the enemy "run away from her [Israel]." Isaiah says that the enemy "will flee far away." A destructive form of a whirlwind is a tornado. A tornado destroys everything in its path and blows the debris far away, which is the picture that Jeremiah and Isaiah give here. The blast of nuclear weapons also destroys everything its path like that of a tornado. Israel may suffer horribly in the "Great Middle East War," but they will miraculously survive yet another war because God will help destroy and push out their enemies with a whirlwind, which might show the use of nuclear weapons. When God rescues Israel, Isaiah says that the nations will "rush like the rushing of many waters," and "make a noise like the roar of the seas." In other words, Israel's neighbors will come "rushing" against her to annihilate her. But God will bring victory to Israel, which causes uproar from the nations. Think for a moment, how the already hostile world toward Israel would react when they defeat their neighbors, in what many presume will be a nuclear exchange. I believe Isaiah appropriately describes the inevitable; that the nations' reaction will be like the "roar of the seas." Psalm 83:1-5 (King James Version) - Keep not thou silence, O God: hold not thy peace, and be not still, O God. For, lo, thine enemies make a tumult: and they that hate thee have lifted up the head. They have taken crafty counsel against thy people, and consulted against thy hidden ones. They have said, Come, and let us cut them off from being a nation; that the name of Israel may be no more in remembrance. For they have consulted together with one consent: they are confederate against thee. Isaiah 26:19-21 - Your dead shall live; together with my dead body they shall arise. Awake and sing, you who dwell in dust; for your dew is like the dew of herbs, and the earth shall cast out the dead. Come, my people, enter your chambers, and shut your doors behind you; hide yourself, as it were, for a little moment, until the indignation is past. For behold, the LORD comes out of His place to punish the inhabitants of the earth for their iniquity; the earth will also disclose her blood, and will no more cover her slain. Interestingly, Psalm 83:3 suggests that Israel's neighbors will come against God, that is, they will make a "crafty counsel" against His people and His "hidden ones." It appears that the "Great Middle East War" starts because the opportunity to attack arises for Israel's enemies in the aftermath of the resurrection and rapture of the Church. Click here to read more parallels that support the rapture occurring near the "Great Middle East War." In fact, the rapture could be the catalyst that gives the "crafty counsel" of Arabs the motive and freedom to come against Israel. These Muslim nations may see this supernatural event as a sign from Allah. After the rapture of the Church, the rest of the world will be in chaos after millions of people disappear from the face of the earth. In other words, many nations, namely Israel's allies, will likely be wrapped up in internal affairs after the rapture of the Church, which would prevent them from coming to Israel's aid. I discuss in detail the possible progression of these events in the study: "Putting the Prophetic Puzzle Pieces Together." Fill their faces with shame, that they may seek Your name, O LORD. Let them be confounded and dismayed forever; yes, let them be put to shame and perish.... Then behold, at eventide, trouble! And before the morning, he is no more. This is the portion of those who plunder us, and the lot of those who rob us. "Therefore prophesy concerning the land of Israel, and say to the mountains, the hills, the rivers, and the valleys, 'Thus says the Lord GOD: "Behold, I have spoken in My jealousy and My fury, because you have borne the shame of the nations." Therefore thus says the Lord GOD: "I have raised My hand in an oath that surely the nations that are around you shall bear their own shame."' Against Damascus. "Hamath and Arpad are shamed, For they have heard bad news. They are fainthearted." The curse-for-curse clause in Genesis 12:3 seems to fit with these passages: "I will bless those who bless you, and I will curse him who curses you." Israel's surrounding neighbors constantly spout off arrogant threats to annihilate them and take the land for themselves. Instead, God will come to the rescue and put these nations to shame by giving much of their land to Israel, to whom it rightfully belongs anyway. Hamath and Arpad, mentioned here in Jeremiah, were gods worshiped by people in and around Damascus centuries ago, as discussed earlier. As we will see in a few sections, God will put to shame all other gods by "reducing them to nothing," as the prophet Zephaniah puts it. Some of this plunder will be land that the enemy occupies today; Israel's borders will expand to engulf much of the real estate of their current neighbors. The passage above in Isaiah 17 shows us how long the war will last. The war will begin in the evening hours and end before morning. As discussed in the next section, the possible use of nuclear weapons could be the reason the war is short-lived. As the fire burns the woods, and as the flame sets the mountains on fire. O LORD, to You I cry out; for fire has devoured the open pastures, and a flame has burned all the trees of the field. The beasts of the field also cry out to You, For the water brooks are dried up, and fire has devoured the open pastures. "The house of Jacob shall be a fire, and the house of Joseph a flame; but the house of Esau shall be stubble; they shall kindle them and devour them, and no survivor shall remain of the house of Esau," For the LORD has spoken. Therefore behold, the days are coming," says the LORD, "That I will cause to be heard an alarm of war in Rabbah of the Ammonites; It shall be a desolate mound, and her villages shall be burned with fire. Then Israel shall take possession of his inheritance," says the LORD. The use of fire is a theme found throughout the "Great Middle East War." I have not included the Amos passages here again, though the prophet said that every nation would be judged with fire. The devastation described is reminiscent of the destruction on the cities of Hiroshima and Nagasaki in Japan at the end of World War II. As mentioned several times, the scale of devastation in this war has led many to believe that Israel will use nuclear weapons. The massive loss of life on Israel's side in the war supports the idea that the threat to Israel's existence will come to the point that they will have no choice but to unleash what is known as the "Samson Option," where Israel would take down their enemies with massive retaliation in the form of nuclear warfare. Because Israel's enemies listed in this war do not have known nuclear weapons, it is likely that the massive loss of life on Israel's part may come in the form of chemical weapons. That being said, there is some structural damage mentioned in Amos 2 to Jerusalem's "palaces," which could be targeted government buildings or official's residences with the use of conventional weapons. God is judges Israel's neighbors in the "Great Middle East War," but as the Obadiah passage shows, Israel will be God's weapon. As a recap, Israel's immediate neighbors will form a confederacy against her. Because Israel has despised God and His Law, God will initially use their neighbors to judge them. This will result in Israel crying out to God. God will hear their prayer and then use Israel to judge the nations that hate them. The passage above in Jeremiah shows that after the war Israel will take possession of their inheritance promised to Abraham, only ever realized under the rule of David and Solomon. We will discuss Israel's land expansion more in a moment. Ezekiel 39:12-16 - "For seven months the house of Israel will be burying them, in order to cleanse the land. Indeed all the people of the land will be burying, and they will gain renown for it on the day that I am glorified," says the Lord GOD. "They will set apart men regularly employed, with the help of a search party, to pass through the land and bury those bodies remaining on the ground, in order to cleanse it. At the end of seven months they will make a search. The search party will pass through the land; and when anyone sees a man's bone, he shall set up a marker by it, till the buriers have buried it in the Valley of Hamon Gog. The name of the city will also be Hamonah. Thus they shall cleanse the land." Will Israel follow decontamination methods because of the fire and brimstone poured out by God in the "Gog and Magog War?" Or will Israel use this method of cleanup because a nuclear war had just taken place in the region previous to the "Gog and Magog" invasion? It is possible that Israel will not have time to clean up after the "Great Middle East War" before Gog and company come in for the kill. Also He said to me, "Prophesy to the breath, prophesy, son of man, and say to the breath, 'Thus says the Lord GOD: "Come from the four winds, O breath, and breathe on these slain, that they may live."'" So I prophesied as He commanded me, and breath came into them, and they lived, and stood upon their feet, an exceedingly great army. "The house of Jacob shall be a fire, and the house of Joseph a flame; but the house of Esau shall be stubble; they shall kindle them and devour them, and no survivor shall remain of the house of Esau," for the LORD has spoken. "As for you also, because of the blood of your covenant, I will set your prisoners free from the waterless pit. Return to the stronghold, you prisoners of hope. Even today I declare that I will restore double to you. For I have bent Judah, My bow, fitted the bow with Ephraim, and raised up your sons, O Zion, against your sons, O Greece, and made you like the sword of a mighty man." "My anger is kindled against the shepherds, and I will punish the goatherds. For the LORD of hosts will visit His flock, the house of Judah, and will make them as His royal horse in the battle. From him comes the cornerstone, from him the tent peg, from him the battle bow, from him every ruler together. They shall be like mighty men, who tread down their enemies in the mire of the streets in the battle. They shall fight because the LORD is with them, and the riders on horses shall be put to shame." "I will strengthen the house of Judah, and I will save the house of Joseph. I will bring them back, because I have mercy on them. They shall be as though I had not cast them aside; for I am the LORD their God, and I will hear them. Those of Ephraim shall be like a mighty man, and their heart shall rejoice as if with wine. Yes, their children shall see it and be glad; their heart shall rejoice in the LORD." These passages show that God uses Israel as His weapon to judge their neighbors. In Zechariah 10, God turns back to Israel again and re-gathers them to the promised land. As mentioned earlier, our generation has been a witness to this re-gathering since Israel became a nation. The passage in Zechariah shows that the Jews will return en mass back to the Holy Land after the "Great Middle East War." Isaiah 51:10-11 - Are You not the One who dried up the sea, the waters of the great deep; that made the depths of the sea a road for the redeemed to cross over? So the ransomed of the LORD shall return, and come to Zion with singing, with everlasting joy on their heads. They shall obtain joy and gladness; sorrow and sighing shall flee away. Recall from the prophecy of the "dry bones" in Ezekiel 37, that God has resurrected the nation Israel. They will begin a spiritual revival in the "Great Middle East War." However, Israel will not receive the Spirit of the Lord until the end of the Tribulation, when they corporately accept Jesus as Messiah (Zechariah 12:10). Ezekiel 28:25-26 - Thus says the Lord GOD: "When I have gathered the house of Israel from the peoples among whom they are scattered, and am hallowed in them in the sight of the Gentiles, then they will dwell in their own land which I gave to My servant Jacob. And they will dwell safely there, build houses, and plant vineyards; yes, they will dwell securely, when I execute judgments on all those around them who despise them. Then they shall know that I am the LORD their God." After the "Great Middle East War," when God judges Israel's neighbors, the Jewish people will feel secure for the first time since their return from exile, as shown in the passage above. Incidentally, Israel "dwelling securely" is a prerequisite condition before the "Gog and Magog War" (Ezekiel 38-39). The Hebrew word "betach," translated as "dwelling securely," is found in both passages of Ezekiel. "Betach" literally means to have confidence and trust. In other words, Israel may feel secure, but may not actually be secure after God judges their neighbors. Isaiah 26-29 are about God judging Israel and the "whole earth," which places these chapters in the Tribulation period. It appears that Israel makes the "covenant with death" because they mistakenly believe it will make them secure by becoming a refuge for them. The problem is that Israel will not seek security in God, even though God will come to their rescue when they cry out to Him during the "Great Middle East War." Therefore, the covenant Israel confirms with the antichrist will lead to death. The confirming of the covenant will mark the beginning of the Tribulation, or more precisely, "Daniel's 70th week" (Daniel 9:27), as discussed in the "Gog and Magog War" and "Pre-Tribulation Rapture" studies. Thus says the LORD: "Has Israel no sons? Has he no heir? Why then does Milcom inherit Gad, and his people dwell in its cities? Therefore behold, the days are coming," says the LORD, "That I will cause to be heard an alarm of war in Rabbah of the Ammonites; it shall be a desolate mound, and her villages shall be burned with fire. Then Israel shall take possession of his inheritance," says the LORD. The seacoast shall be pastures, with shelters for shepherds and folds for flocks. The coast shall be for the remnant of the house of Judah; they shall feed their flocks there; in the houses of Ashkelon they shall lie down at evening. For the LORD their God will intervene for them, and return their captives. "And Edom shall be a possession; Seir also, his enemies, shall be a possession, while Israel does valiantly. Out of Jacob One shall have dominion, and destroy the remains of the city." "But on Mount Zion there shall be deliverance, and there shall be holiness; the house of Jacob shall possess their possessions." The South shall possess the mountains of Esau, and the Lowland shall possess Philistia. They shall possess the fields of Ephraim and the fields of Samaria. Benjamin shall possess Gilead. And the captives of this host of the children of Israel shall possess the land of the Canaanites as far as Zarephath. The captives of Jerusalem who are in Sepharad shall possess the cities of the South. Then saviors shall come to Mount Zion to judge the mountains of Esau, and the kingdom shall be the LORD's. I will whistle for them and gather them, for I will redeem them; and they shall increase as they once increased. "I will sow them among the peoples, and they shall remember Me in far countries; they shall live, together with their children, and they shall return. I will also bring them back from the land of Egypt, and gather them from Assyria. I will bring them into the land of Gilead and Lebanon, until no more room is found for them." These passages show how much land Israel will gain after the "Great Middle East War." Jeremiah tells us that Israel will take the area of Gad, which lies in current day Jordan. Obadiah shows us that the land expansion will extend to the mountains of Esau (in Edom, or southern Jordan), Philistia (the Gaza Strip), Ephraim and Samaria (the West Bank), Gilead (mountains east of the Jordan River), Zarephath (a city between Tyre and Sidon in Lebanon), and the cities of the South (the Negev). Zephaniah shows that the Mediterranean coast (from the Gaza Strip north and including Lebanon to the Euphrates River) will belong to Judah. Zechariah shows that Israel will take the land of Gilead (mountains east of the Jordan) and Lebanon. As an interesting side note, Obadiah shows that the Jewish exiles from Sepharad will possess the cities of the South, which is in the Negev. Sepharad is another name for Spain. In other words, after the "Great Middle East War," it seems that circumstances will encourage Spanish Jews to immigrate to Israel, and live in cities in the Negev. The land that Israel gains in the "Great Middle East War" is the same area of land that God promised to Abraham. Though God promised the area of Lebanon to Abraham, it was not taken by Israel in the Old Testament conquests. Lebanon was among the nations God used in the Old Testament to test Israel (Judges 3:1-4). Later Lebanon was an ally during the reigns of David and Solomon. 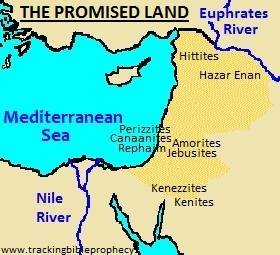 Genesis 15:18-21 - "On the same day the LORD made a covenant with Abram, saying: "To your descendants I have given this land, from the river of Egypt to the great river, the River Euphrates - the Kenites, the Kenezzites, the Kadmonites, the Hittites, the Perizzites, the Rephaim, the Amorites, the Canaanites, the Girgashites, and the Jebusites." Deuteronomy 11:24 - Every place on which the sole of your foot treads shall be yours: from the wilderness and Lebanon, from the river, the River Euphrates, even to the Western Sea, shall be your territory. Ezekiel 47:13-17 - Thus says the Lord GOD: "These are the borders by which you shall divide the land as an inheritance among the twelve tribes of Israel. Joseph shall have two portions. You shall inherit it equally with one another; for I raised My hand in an oath to give it to your fathers, and this land shall fall to you as your inheritance. This shall be the border of the land on the north: from the Great Sea, by the road to Hethlon, as one goes to Zedad, Hamath, Berothah, Sibraim (which is between the border of Damascus and the border of Hamath), to Hazar Hatticon (which is on the border of Hauran). Thus the boundary shall be from the Sea to Hazar Enan, the border of Damascus; and as for the north, northward, it is the border of Hamath. This is the north side." Ezekiel 47:18-21 - "On the east side you shall mark out the border from between Hauran and Damascus, and between Gilead and the land of Israel, along the Jordan, and along the eastern side of the sea. This is the east side. The south side, toward the South, shall be from Tamar to the waters of Meribah by Kadesh, along the brook to the Great Sea. This is the south side, toward the South. The west side shall be the Great Sea, from the southern boundary until one comes to a point opposite Hamath. This is the west side.Thus you shall divide this land among yourselves according to the tribes of Israel." 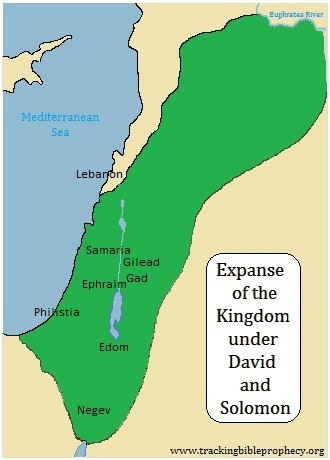 Based on land expansion described after the war, the Abrahamic land covenant could be the covenant in Daniel 9. This supports the notion that the "Great Middle East War" is the event that will lead to the beginning of "Daniel's 70th week." Ezekiel 39:11 - "It will come to pass in that day that I will give Gog a burial place there in Israel, the valley of those who pass by east of the sea [Dead Sea]; and it will obstruct travelers, because there they will bury Gog and all his multitude. Therefore they will call it the Valley of Hamon Gog." 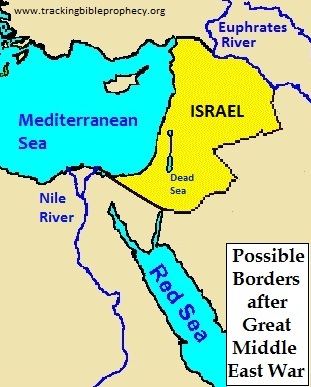 The map pictured to the left shows possible borders of Israel after the "Great Middle East War," based on the passages in this section. If you compare this map to those of the millennial land grant and the greatest extend of the kingdom under David and Solomon, you will notice that it is slightly larger. While the eastern extent of the millennial land grant is not really known, the area of Jordan will become a "perpetual waste" (Ezekiel 35, Zephaniah 2:9). Therefore, even though Jordan will be under Israeli sovereignty during the Tribulation, no one will live there during the Millennium, hence the difference in borders in the suggested maps. "I will also break the gate bar of Damascus, and cut off the inhabitant from the Valley of Aven, and the one who holds the scepter from Beth Eden. The people of Syria shall go captive to Kir," Says the LORD. A mixed race shall settle in Ashdod, and I will cut off the pride of the Philistines. I will take away the blood from his mouth, and the abominations from between his teeth. But he who remains, even he shall be for our God, and shall be like a leader in Judah, and Ekron like a Jebusite. The passages above describe the people left from the nations that come against Israel in the "Great Middle East War." These captives will live in Kir in Moab, or western Jordan, and to the west in cities in Gaza. They will be under Israel's sovereignty because of the land expansion described in the previous section. There is encouraging news in the Zechariah passage, as we find that the captives accept the God of Israel after the "Great Middle East War." Since the captives will serve God, it is likely that they will live under Israel's sovereignty willingly and peacefully in the designated areas listed in these passages. "You Ethiopians also, you shall be slain by My sword." And He will stretch out His hand against the north, destroy Assyria, and make Nineveh a desolation, as dry as the wilderness. The herds shall lie down in her midst, every beast of the nation. Both the pelican and the bittern shall lodge on the capitals of her pillars; their voice shall sing in the windows; desolation shall be at the threshold; for He will lay bare the cedar work. This is the rejoicing city that dwelt securely, that said in her heart, "I am it, and there is none besides me." How has she become a desolation, a place for beasts to lie down! Everyone who passes by her shall hiss and shake his fist. He shall pass through the sea with affliction, and strike the waves of the sea: All the depths of the River shall dry up. Then the pride of Assyria shall be brought down, and the scepter of Egypt shall depart. "So I will strengthen them in the LORD, and they shall walk up and down in His name," Says the LORD. In Psalm 83, the coalition against Israel is fairly clear-cut. The members of the confederacy are Jordan, the West Bank, Lebanon, Gaza, and Syria. However, in the parallel passages above, we find a few countries that are not listed as aggressors in the war. Ethiopians, or the Cushites, are largely in present day Sudan, but may include present day Ethiopia too. They are not listed in the Psalm 83 coalition, but in the "Gog and Magog" coalition. It is possible that even though they are not aggressors in the war, there could be collateral damage that extends as far as Sudan or Ethiopia. This might explain their presence in the Gog and Magog coalition; Sudan might be out for revenge. While it is true that the Assyrians ruled over Babylon before the Babylonian empire rose, the heart of the Assyrian empire covered northern Syria and western Iraq. 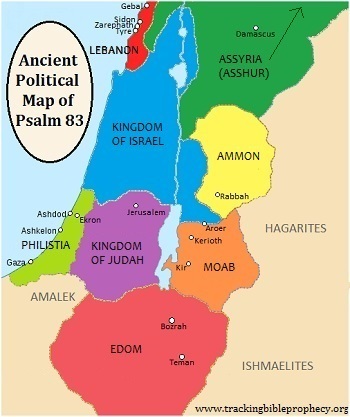 This is important to note, because Assyria is in the Psalm 83 confederacy. I do not believe Iraq as a nation will be an aggressor in that conflict. Iraq is better represented by the heart of the ancient area of Babylon, which is not in view in the parallel passages to Psalm 83. However, the area of Mosul is in western Iraq and is the same area of ancient Nineveh which gets destroyed according to Zephaniah. In recent history, the Kurds have occupied the ancient area of Nineveh. The Kurds have continuously struggled with both Turkey and the rest of Iraq. There have even been proposals made to allow the Kurds to break away and be their own country. If this occurs before the "Great Middle East War," I wouldn't rule out their direct involvement in the Psalm 83 coalition, as politically they could be considered the heart of ancient Assyria along with northern Syria. 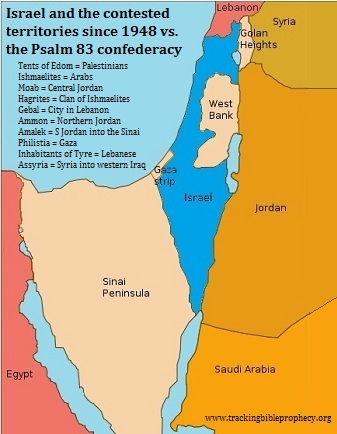 Another possibility is that rebels aligned with the other Psalm 83 aggressors take over the western part of Iraq before the "Great Middle East War." Interestingly, the terrorist group ISIS has laid claim to most of the territory of ancient Assyria as a result of the civil war in Syria that started in 2011, and the insurgency of western Iraq in the summer of 2014. Note that Babylon is not mentioned in the Psalm 83 confederacy. So if the Iraq insurgency is prophetic, the rebels will not take eastern Iraq. In fact, the goal of ISIS is not to take southern Iraq, but extend their territory south through Lebanon and Israel to form the "Levant." Incidentally, this is roughly the same real estate Israel conquers in the "Great Middle East War." The apparent reshaping of the Middle East suggests that God might be using these conflicts to return the boundaries to their ancient lines before the next prophetic war. If this is the case, Nineveh's destruction is not collateral damage, but a target of war. While Egypt is not listed as an aggressor in Psalm 83, the passage above in Zechariah shows that God will judge the leadership of Egypt at the same time as Assyria. While this passage reaches out to the Millennium, when both countries follow the God of Israel, it is possible that Egypt gets drawn into the Psalm 83 conflict due to collateral damage extending to their region. Isaiah 28:25-26 - "'Thus says the Lord GOD: "When I have gathered the house of Israel from the peoples among whom they are scattered, and am hallowed in them in the sight of the Gentiles, then they will dwell in their own land which I gave to My servant Jacob. And they will dwell safely there, build houses, and plant vineyards; yes, they will dwell securely, when I execute judgments on all those around them who despise them. Then they shall know that I am the LORD their God."'" Isaiah 11:11-12 - It shall come to pass in that day that the Lord shall set His hand again the second time to recover the remnant of His people who are left, from Assyria and Egypt, from Pathros and Cush, from Elam and Shinar, from Hamath and the islands of the sea. He will set up a banner for the nations, and will assemble the outcasts of Israel, and gather together the dispersed of Judah from the four corners of the earth. Isaiah 11:13-15 - Also the envy of Ephraim shall depart, and the adversaries of Judah shall be cut off; Ephraim shall not envy Judah, and Judah shall not harass Ephraim. But they shall fly down upon the shoulder of the Philistines toward the west; together they shall plunder the people of the East; they shall lay their hand on Edom and Moab; and the people of Ammon shall obey them. The LORD will utterly destroy the tongue of the Sea of Egypt; with His mighty wind He will shake His fist over the River, and strike it in the seven streams, and make men cross over dryshod. We see that Ephraim and Judah would be reconciled again as one nation, when the people of Israel return a second time from exile, as prophesied in Ezekiel 37, being fulfilled in our generation. The Isaiah passage also includes an unfulfilled prophecy, where Israel will defeat the people in Philistia (the Gaza Strip), Edom (southern Jordan), Moab (central Jordan), and Ammon (northern Jordan); all members of the "Great Middle East War." The passage in Isaiah goes on to describe a battle toward the south. As Israel is coming against the people in the west (Palestinians in Gaza? ), God will destroy the tongue of the Nile Delta with His mighty wind, or whirlwind. But God said that He will use Israel to judge the nations around them. Perhaps the mighty wind will be a nuclear blast set off close to the Nile Delta, as discussed a few sections back. (For more on Egypt in light of current events, click here). If there is an existential threat to Israel, there is no doubt that they will unload all they have on their enemies. This strategy is known as the "Samson Option," named after the biblical account in the book of Judges, where Samson knocked down the pillars in a Philistine pagan temple, killing himself and all his enemies. You can imagine in a dire situation like this, that in the chaos it would be difficult to figure out who exactly the aggressors are and who to target. Israel may unleash on everyone they consider an enemy. This could be why Egypt and Sudan suffer collateral damage, even though they are not listed as aggressors in the war. Fill their faces with shame, that they may seek Your name, O LORD. Let them be confounded and dismayed forever; yes, let them be put to shame and perish, that they may know that You, whose name alone is the LORD, are the Most High over all the earth. In that day a man will look to his Maker, and his eyes will have respect for the Holy One of Israel. He will not look to the altars, the work of his hands; He will not respect what his fingers have made, nor the wooden images nor the incense altars. The LORD will be awesome to them, for He will reduce to nothing all the gods of the earth; people shall worship Him, each one from his place, indeed all the shores of the nations. The burden of the word of the LORD against the land of Hadrach, and Damascus its resting place (For the eyes of men and all the tribes of Israel are on the LORD). In conclusion, we will end on a sobering but positive note. The "Great Middle East War" will be a spiritual turning point for not only Israel, but for humanity. In Zephaniah, we see that God "will reduce to nothing all the gods of the earth." Many people will come to worship the God of Israel after the war. Ezekiel 39:7 - So I will make My holy name known in the midst of My people Israel, and I will not let them profane My holy name anymore. Then the nations shall know that I am the LORD, the Holy One in Israel. To read all the passages in the "Great Middle East War" in context, continue to the next page.